What do you get when you mix artist-activists, alcoholic beverages, the 25th anniversary of the EDSA People Power Revolution and a webcam? A lot of insightful commentary actually. Love is tiny soap and free half-chicken. 1. Ang Edsa ay parang love — sa una lang masaya. 2. Ang Edsa ay parang love — nauuwi sa Mahal Kita lodge. 3. Ang Edsa ay parang love — kapag gipitan na, kahit ano na lang pwede na. 4. Ang Edsa ay parang love — maraming struggle. 5. Ang Edsa ay parang love — puro promises. 6. Ang Edsa ay parang love — di ka talaga makamove on. 7. Ang Edsa ay parang love — may theme song. 8. Ang Edsa ay parang love — kailangan ng balls. 9. 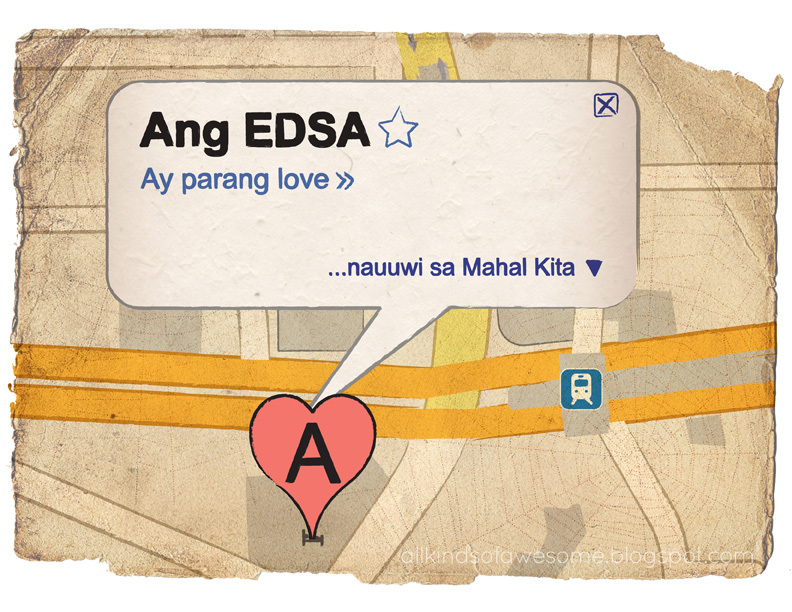 Ang Edsa ay parang love — magpapatuloy pa rin. 10. Ang Edsa ay parang love — nangangarap pa rin. Get in on the alcohol-fueled discourse. Katipon airs every month on Ustream. Click here to view channel. The shenanigans on the channel’s chat box can swing from crazy to crazy deep — fun is had by all. Plus, we’ll be taking a stab at solving people’s love woes from midnight onwards. Papa Jack has nothing on Tado. Follow Dakila on Twitter or on Facebook for updates on the schedule. Wanted to drop a comment and let you know your Feed isnt working today. I tried adding it to my Google reader account and got absolutely nothing. Hmm. Thanks for the heads up. Will definitely look into fixing my RSS feed.